Kythira, Kithira, Kythera, Kithera, Cythira, Cithira, Cythera, Cithera, Ionian Islands, Greek Tourist Offices Guide. The island of Kithera located in the Mediterranean Sea 14 nautical miles off Kavo Maleas on the south-eastern most tip of the Peloponnese between Crete and Peloponesse, with name Kithera or Cerigo. Ships dock at Agia Pelagia near a beautiful stretch of coastline and bathing beach. 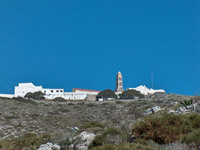 The capital, Kythera, 30km (19 miles) south, is easily reached on the main roadway which crosses the island. It is a neat hamlet, built on a hillside overlooking the sea, which is crowned by a Venetian castle. Kapsali is the main harbour. Mostly rocky with many streams, it produces wine, goat cheese, olives, corn, and flax. On the south shore is Kithira (1971 pop. 349), the chief village, formerly called Kapsali. Ancient Kithira was a center of the cult of Aphrodite. The island passed to Greece in 1864. A Voyage to Kithera means to many people a nostalgic wandering in exotic and dreamt places, just like in Wattaeu's romantic painting The Embarkment for the Island of Kythera (L' Embarquement pour l' ile de Kythere). 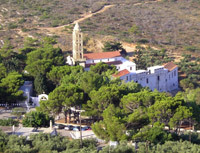 The myth of Kythera, also known as the island of love, goes far back in the traditions of France and Italy. Voyage to Kythera, a difficult task, an island to which pilgrims set out but never succeed in arriving. As long as it stays far, preserves its distant spark as a land of eternal destination, impossible dream and ideal beauty. Since ancient times Kithera is related to the myth of Aphrodite, the goddess of beauty and Eros. There it lies in her heavenly haze as a land as much utopic as well real and within reach. Reality brings us to a place of myth, not so distant as it is presented in the tradition of literature, but with its marks strong. It is enough to walk on the clear beaches and watch the sunset, for this to be felt. Somewhere there, the sky meets the sea painting it with its scarlet reflections and perhaps someone could witness the birth of Aphrodite, daughter of Uranus and Sea. One might even see a piece of the never ending Sky (Uranus) fall, due to the mighty slash from Cronos, in the life-giving Sea, who wraps it with her froth. Perhaps one could also feel the distinct breeze of Zephyros, who rendered Aphrodite to the world and prepared her to take her place in the mighty mythological Olympus. Cretes, Phoenicians, Hellenes, Romans, Byzantines, Venetians, French, British, they all took part in the creation of the island's tradition, building a social, economical and cultural originality, which balances the hellenic tradition with the western influence in a harmonic wholeness. A totality that contains past and present, the roughness of nature and the stillness of human structure, the abandonment of whole villages in a quest for better luck in the big cities or even abroad, mostly in Australia, and the nostalgia and the will for homecoming after confronting privation and suffer. Today still one can hear the air blow through the empty houses that used to be full of life, being witnesses of a different era. As the sun brakes out of the mist dissolves the mist - provenza, as it is called on the island - and clears the sky in modern Kythera, one can feel the struggle for going on. While the island's economy progressively heads towards tourism and efforts are made for developing appropriate infrastructure, it is obvious that a new era lies in front of us.